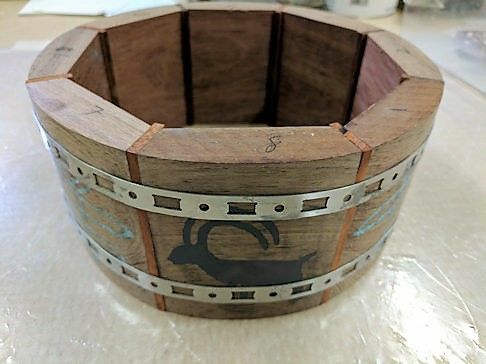 It’s been a couple of years (life is way too busy) since my last segmented bowl projects, a Southwest style bowl, and my Ugliest Bowl – which I made to link the past with the present. Since then, I’ve been seeking inspiration for a new project, and I found it in an unusual place. It too combines old and new. 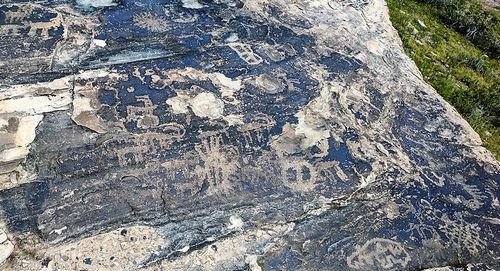 Near our Southern Utah home are many ancient petroglyphs, considered to be quite old (probably well over a thousand years) as measured by the “desert varnish” that coats them. 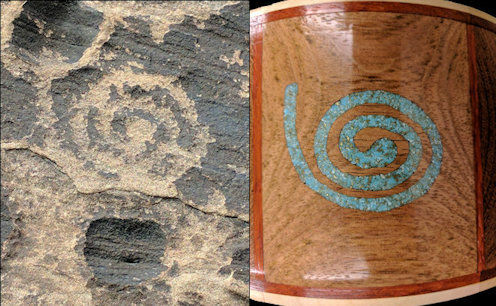 Petroglyphs, or “rock art” are common to many parts of the USA. 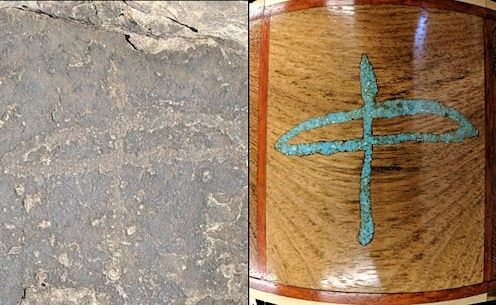 Some believe them to be just primitive “scratchings” of no particular significance beyond artistic expression. 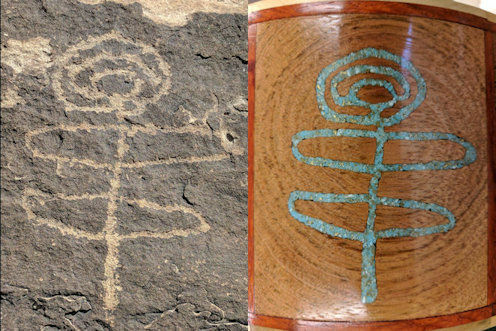 Others believe them to be a symbolic expression of a sign language universal among the many Native American tribes, that allowed a form of communication despite their having totally different spoken languages. 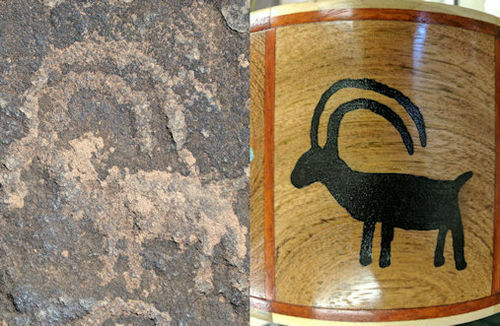 I favor the latter view, which I believe explains the similarity of petroglyphs in many widely separated locations. 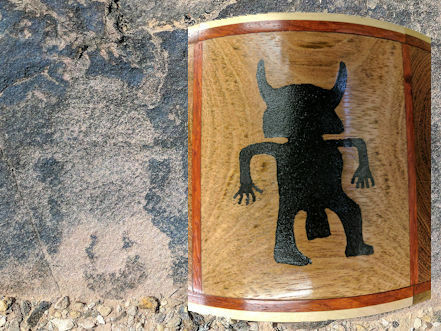 I thought perhaps I could incorporate some of these designs into a bowl, as a way of honoring the ancient artists who made them, and also allowing me to try out some inlay techniques I’d been reading about. 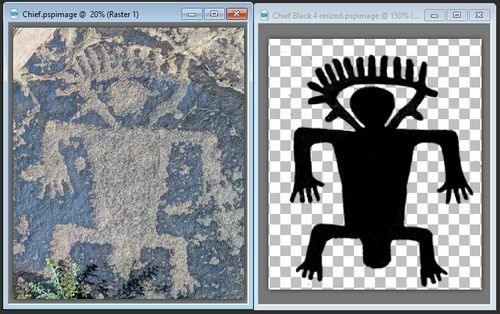 I took photographs of several of the petroglyphs and attempted to duplicate the design as accurately as possible by using my computer to create a black image of the petroglyph from the photo, which then became my pattern for engraving the design into wood. Instead of gluing up the segment blocks, turning the ring, and then engraving the designs (which one would normally do), I actually created the radius of the design ring segments using my bandsaw. Having never engraved anything before, I was afraid if I created the entire ring first, I might ruin the whole thing if I made a mistake on any one of the engravings. Fortunately, that didn’t happen. So after engraving, filling, and sanding the design pieces, I glued up the ring. “Manasseh”. This is the most fascinating of all. 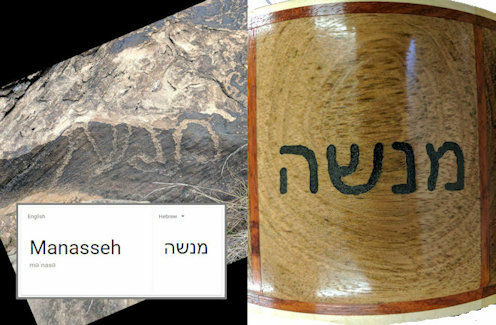 Compare the petroglyph to the word “Manasseh” in Hebrew and consider the implications. You be the judge! Spiral: Meant to call attention to something or indicate direction. My segmented bowl projects would be easier if I could see the end from the beginning, but seldom do they turn out the way I originally envision them,—which is for the better, I think. 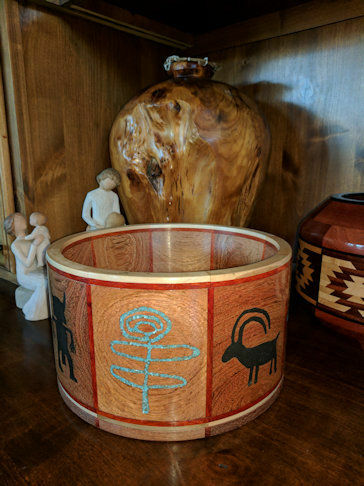 Originally I planned to add additional top rings and taper the bowl at the top, but as this progressed, it began to remind me of a Native American drum, or “tom-tom”, so I decided to leave it like that as one more symbol of their culture. This has been an interesting project. I hope it doesn’t take me two years to get to the next one! -- Brent H. --"This retirement stuff is hard work. I need to go get a job so I can get some rest!" Great idea, this should generate a lot of conversation when people see it! I really like your concept here. How wonderful to see the orignal artwork, and then be able to make the bowl . I love the choices you made.Terrific piece. Wow! this is such a beautiful piece and I love the art. I love the idea and “story” . I’m glad you decided to leave the walls straight, don’t know why but it just seems the right result. Congratulations on a great piece. Very interesting project and well done. 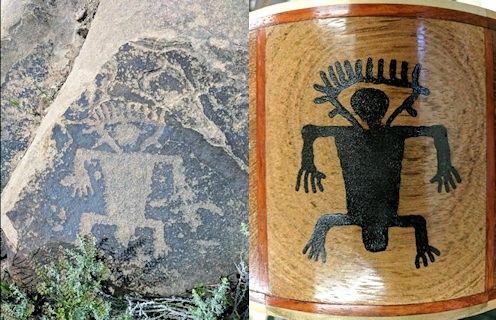 I really enjoyed see the petroglyphs and then your use of it. That is a beautiful bowl. I also think you did the shape just right. 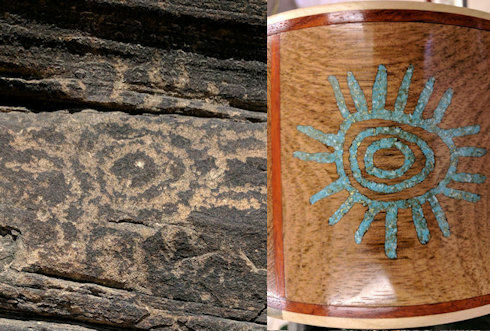 Too fancy of a shape would not have fit the simplicity of the Native art. Wonderful job. Great piece of work much enhanced by the accompanying narrative.